Posted December 30, 2015 by Bailey Heard & filed under Blog, FeaturedOnHomePage. “I wish Daddy was here. Making cookies in the easy bake oven would be way more fun with me, you, and Daddy,” Ellie said. We had this conversation on Christmas day and it still amazes me how at her age she feels such a void from her Daddy’s absence on holidays. I could tell she was especially needy of me on this day because she wanted me to play with each one of her toys with her and wouldn’t let me out of her sight. My way of coping was to stay busy, organizing her toys and “being productive.” This created a lot of tension between the two of us as it took my focus away from her and we both ended up pretty frustrated at not being able to do what we each wanted to do. At one point, I stopped and thought, Bailey, don’t miss it. Don’t miss out on these special moments because you’re sad and miss Andrew. Live. Be present. Enjoy Ellie. That one moment really transformed my thoughts, then my feelings, and went on to shape my overall attitude about the day. I allowed myself to feel sad and chose to stop distracting myself from the pain. 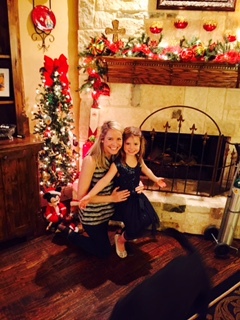 Instead, I refocused my attention and energy on being present and enjoying spending time with my daughter on Christmas day. To me, it boiled down to gratitude. Choosing to focus on what I did have versus what I did not. Andrew was gone, but Ellie was here. Gratitude gives us a different perspective on our pain and allows us to see pain’s gifts, which can provide meaning and hope for a brighter tomorrow. It’s been a long and bumpy road to get to this place where I genuinely feel grateful for both the “good” and the “bad” experiences in life (mind you, some days I still find it takes a little longer to shift into gratitude mode). The ultimate measure of a man is not where he stands in moments of comfort and convenience, but where he stands at times of challenge and controversy. Faith gives you the strength to jump into challenge. Love, Daddy. Andrew was the ultimate example of choosing faith and gratitude in the midst of challenge. 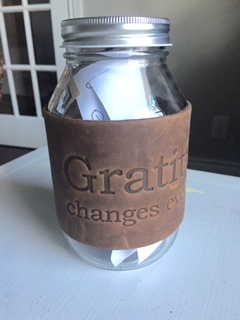 Every year on New Year’s Eve I love thinking back on the year and writing down what I’m grateful for. I find it’s a great way to acknowledge and celebrate the past year and it puts me in a positive place to start the New Year. I would love to hear some of the things you are grateful for in 2015. Please share in the comments so I can celebrate with you! Thank you so much for taking time to hang out with me today. It’s always a pleasure to share my heart with you! Hope you have a happy New Year! Blessings.